Telecom service providers are participants in a fiercely competitive arena and all the players, irrespective of their location or size, are putting their best efforts in either retaining their subscribers or acquiring new ones. Technology itself is moving at a massive pace forcing all operators to make large scale investments. Today’s telecommunications environment characterized by increasing customer demand for new products and services, emergence of new competitors and a rapidly evolving technological landscape – requires a fast and responsive business model. As telecommunications service providers introduce new services and look for rapid ROI, they face three key challenges, namely, network flexibility, rapid service development, and operational efficiency. Addressing these requires enterprises to explore, evaluate and adopt new processes. Cost-effective network scalability and re-usability can be enabled through a network abstraction layer. Rapid development can be realized through increased use of partnerships. And finally, operational excellence can be achieved through modular global sourcing of systems and processes. In this competitive landscape, Quintegra is helping telecom enterprises gain new agility in responding to change with a dedicated telecommunication practice that blends industry knowledge, targeted services, technology and functional expertise with a proven global delivery model. The telecom practice is a key focus area for Quintegra. In the last several years we have worked with telecom majors across the globe. Quintegra has the ability and expertise to quickly and efficiently catalyze the process of provisioning performance evaluation and quality control services for telecom carriers and equipment vendors alike. Data and voice traffic running over numerous media multiplies consistently and the ability to view, access and transmit this information has restructured the world’s economy. With innovation in the telecom sector driving ahead with full force, we leverage our expertise in the area to ably ensure the integrity of these networks. Quintegra combines its expertise in technology with a profound understanding of the telecommunications industry, to provide innovative solutions and versatile support systems to network operators, service providers, telecom & datacom equipment vendors, and product companies, enabling them to offer competitive and value-added services to customers, reduce the response time and billing operations’ cost, maximize revenue, and most importantly, improve customer relationships. Quintegra offers COTS (commercial, off-the-shelf products) assessment, implementation as well as custom development of BSS / OSS. We undertake performance testing, solving data extraction issues and testing functionality of BSS / OSS. We have in-depth understanding of mediation layer for enabling convergence, service unification and session mobility. Our BSS / OSS services enable online usage collection, data correlation & aggregation, error correction, robust rule engines, web-based management, easy & quick addition of network elements, advanced reporting and real-time mediation. With design and development expertise in diverse platforms, usage of best-of-breed tools and techniques, combined with our state-of-art software development facilities, Quintegra delivers significant business benefits to our telecom clients through development of customized applications such as internal applications and device drivers. Quintegra offers scalable end-to-end application development and management solutions from requirement analysis to deployment and rollout. Our mature yet flexible CMM rated process framework instills stringent quality measures in our solutions giving customers confidence in our predictable, low-risk, and high-quality development and maintenance services. 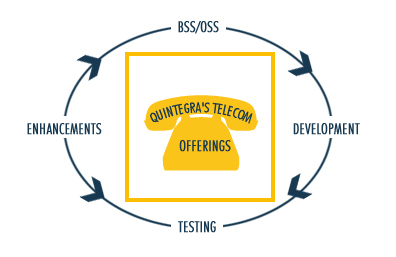 Testing for the telecom domain is one of the core competencies of Quintegra. We offer end-to-end testing services for mobile and network equipments such as performance testing, automated regression testing, load / volume testing for deployment of new applications by carriers, compatibility testing for a variety of handsets, OEMS and switches with different carriers, functional testing of mobile applications, compliance testing which are required by Regulators and protocol stack compatibility testing. Quintegra also offers enhancement services for telecom enterprises such as database fine-tuning, application migration & reengineering and middleware integration. We have partnered with telecommunications clients in a variety of engagement models, based on their requirements. We provide high-quality consulting and services leveraging the strength of the strong relationships Quintegra forges with our telecommunications clients.